Meet your guide at Hotel Granvia Osaka in the morning, then head to Osaka station to take your non-reserved seat on the JR Shinkansen for the train ride to Himeji station. From the station, walk for a few minutes to reach Himeji Castle, a UNESCO World Heritage site. 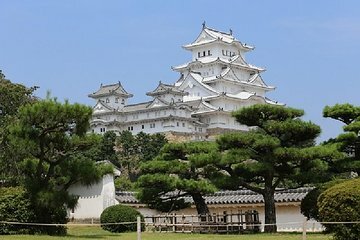 The national treasure is also known as Shirasagi Castle (White Heron Castle), as it resembles a white heron in flight. Your guide shows you around the sprawling five-story complex. Admire the detailed artistry of the 14th-century castle and hear about feudal times in Japan. Next, step outside on the grounds of Himeji Castle to relax over a diverse lunch buffet with both Japanese and Western fares. Sated, you will depart Himeji on the JR Special Rapid Service or Rapid Service (non-reserved seat) and head to Maiko station, located just a short walk from Akashi Kaikyo Bridge. Peruse the exhibits in the Bridge Exhibition Center to learn about more about this suspension bridge, which stretches 12,828 feet (3,910 meters) between the city of Kobe and Awaji-shima Island. Your guide then takes you for a stroll on the Maiko Marine Promenade, an observation walkway with sections of glass flooring through which you can glimpse the waters of Akashi Strait below your feet. The promenade is located under the bridge roadway, 154 feet (47 meters) above the water, and offers another perspective on the bridge and its surroundings. After visiting the bridge, return via train to Kyoto Station when your tour ends in the early evening.